Army Staff Sergeant Ronell Bradley was on his third deployment when he lost both of his legs and sustained severe hand injuries when the vehicle he was riding in ran over an improvised explosive device (IED) in Baghdad, Iraq on Sept. 21, 2005. Sitting in the front passenger seat, the IED blast caused SSG Bradley’s weapon to explode in his hand, amputating his thumb and palm. The impact of the blast instantly taking his right leg and severely injuring his left leg. Unaware of the severity of his injuries, SSG Bradley had to be pulled from the wreckage while under enemy fire. Evacuated to the hospital in the Green Zone, SSG Bradley was later airlifted to Germany before arriving stateside at Walter Reed Army Medical Center where his left leg and right pinky finger were amputated. Sustaining a traumatic brain injury (TBI) with short term memory loss, SSG Bradley spent three months in the hospital and another nine months undergoing extensive therapies while learning to use his new prosthesis. SSG Bradley enjoys spending time with his wife, Cynthia, and his two stepsons. 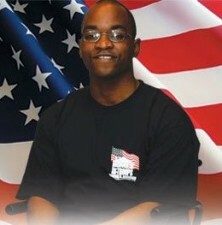 His goal is to obtain his PhD in Healthcare Management and pursue a career with the Department of Veterans Affairs. Ronell enjoys movies,martial arts, weight lifting and traveling. He is a member of AMVETS, DAV, PVA, the American Legion and the Military Order of the Purple Heart. “My family and I would like to thank you for helping us and others like us live as close to normal lives as possible. This assistance helps me be more mobile and independent and allows me to conduct daily activities in a way that reinforces independence… I am able to do things that I usually rely on my family to do for me,” says Ronell.